With the US and the EU imposing fresh sanctions against Iran, India is exploring all possibilities to keep the Iranian oil flowing as it is critical to its energy security. One of the options being discussed is firming up an arrangement with Russia’s Gazprombank for paying to Iranian oil. In the wake of the US and the European Union approving fresh sanctions and an oil embargo against Iran, India has no choice but to step up its efforts to find new ways to pay for Iranian hydrocarbons. Unlike Turkey, the current mediator between Indian and Iranian oil companies, one of the most convenient options seems to be using the Russian banking system, which is not facing a lot of pressure. To keep Iranian oil flowing as it contributes around 12 per cent of New Delhi’s oil imports, India had started preparing in advance for the introduction of the EU oil embargo against Iran. An Indian multi-ministerial delegation visited Tehran from January 16 to 21 to discuss with Iranian colleagues the possibility of changing the current payment methods for Iranian oil. According to Indian media reports, India is exploring the possibility of opening a bank account in another country, perhaps with Russia’s Gazprombank. The desire for such an arrangement was expressed by Indian Oil Corporation and Bharat Petroleum Corporation, India’s two largest oil refiners. Indian Prime Minister Manmohan Singh discussed the question of opening accounts with Russian politicians during his visit to Moscow in December. Gazprom has not yet released information about a possible deal. Another proposed way to change the payment scheme for Iranian oil would be to transition to a barter system. India would invest in other sectors of Iran’s economy and in return receive an equivalent amount of Iranian oil. The other alternatives that are being explored include paying for Iranian oil in Indian currency or Japanese yen. There is also a possibility of paying through gold. Tehran receives around $12 billion annually from New Delhi for oil (12% of India’s total oil consumption), and both countries wish to maintain trade volumes. However, with the progressively worsening economic sanctions against Iran, imposed unilaterally by the US and the European Union, there are fewer opportunities for India-Iran cooperation. For India’s oil companies, this situation could lead to serious economic losses. 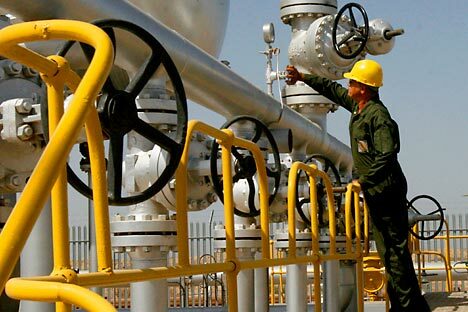 On January 23, the EU approved an oil embargo against Iran, which was yet another severe blow to India’s oil imports. Under the resolution, as of July 1, all oil contracts between the EU and Iranian suppliers will be canceled and all previously signed contracts will be in effect until July 1, after which they will also be scrapped. In addition, European countries will freeze all assets of the Central Bank of the Islamic Republic. Earlier, on December 31, Washington approved another round of sanctions, according to which the U.S. will block access to its financial system for any foreign banks that continue to cooperate with the Central Bank of Iran. The vast majority of India’s payments for Iranian oil pass through precisely that bank. At the same time, Western diplomats have increased pressure on Turkey, which starting last July provided India with an account at their HalkBank to pay for Iranian oil supplies. According to Bloomberg, in January Ankara told New Delhi that it would suspend service of that account. India has maintained that as a responsible member of the international community it will abide by the UN sanctions on Iran, but is not duty-bound to implement unilateral sanctions by the US and the EU. On the contrary, Indian officials have indicated that they will find a way to keep Iranian oil flowing without attracting US and EU sanctions. The Western economic sanctions are aimed at forcing Iran to resume negotiations on the country’s nuclear programme that is suspected of developing an atomic bomb. Iran denies these allegations, but has refused to let the IAEA inspectors into some of its nuclear facilities. The UN Security Council imposed four packages of sanctions against Iran, but the US and the EU believe that these economic measures are not enough. Tehran does not intend to compromise and claims that the sanctions will not force it to abandon what it calls peaceful nuclear development. If India doesn’t succeed in finding a way to sustain Iranian oil supplies, it plans to seek new partners. The most likely new partners appear to be countries in the Arabian Peninsula, particularly Saudi Arabia, as well as Latin and South America. In the meantime, India is trying to buy as much Iranian oil as possible. Indian Oil Minister S. Jaipal Reddy stated as much at an international conference on energy in New Delhi. According to him, Iran’s oil prices are too advantageous to immediately renounce the partnership. Before the oil embargo, EU countries consumed approximately 20% of Iranian oil, worth about $13 billion per year. Besides India, which receives 18% of Iranian oil exports, the largest buyers of Tehran’s hydrocarbon are China (20%), Japan (18%), and South Korea (9%). So far, none of these countries have supported the oil embargo.